Now We Know: Donald Trump's Hair Care Secrets : The Two-Way "I get a lot of credit for comb-overs," he tells Rolling Stone. "But it's not really a comb-over. It's sort of a little bit forward and back." Donald Trump in Portsmouth, N.H., on April 27. 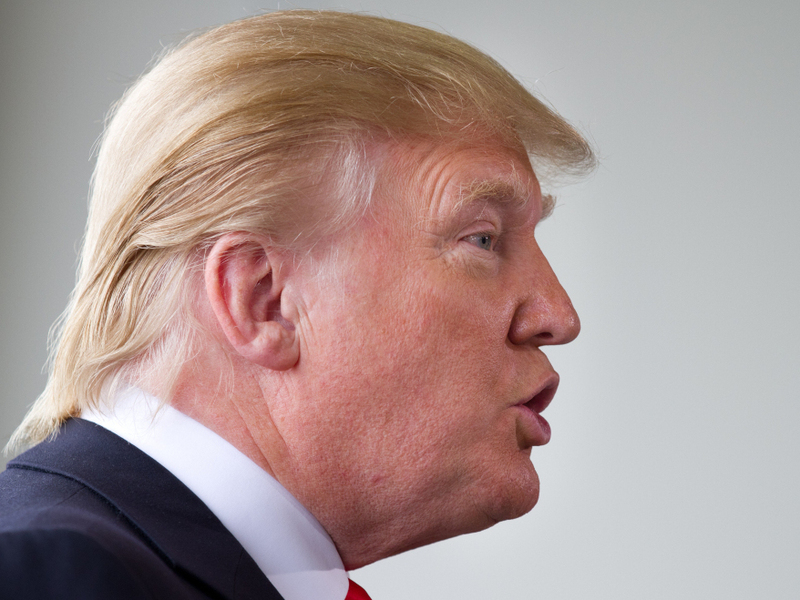 How does developer/reality TV personality/would-be politician Donald Trump get his hair to do that? Well, Trump says it's not a comb-over. "Do I comb it forward? No, I don't comb it forward. ... I actually don't have a bad hairline. When you think about it, it's not bad. I mean, I get a lot of credit for comb-overs. But it's not really a comb-over. It's sort of a little bit forward and back. I've combed it the same way for years. Same thing, every time." Gawker, by the way, posted video last December that does indeed seem to show that Trump has a pretty good hairline (especially compared to this blogger). And Vanity Fair has done a rather irreverent "360-Degree Annotated Slide Show Of Donald Trump's Head."